Adorn your bedroom with the fine leather upholstery and the hand forged ironwork of this luxurious, handcrafted, ranch style bed. The bed has a solid wood, framed headboard, with a curved, open, top panel. 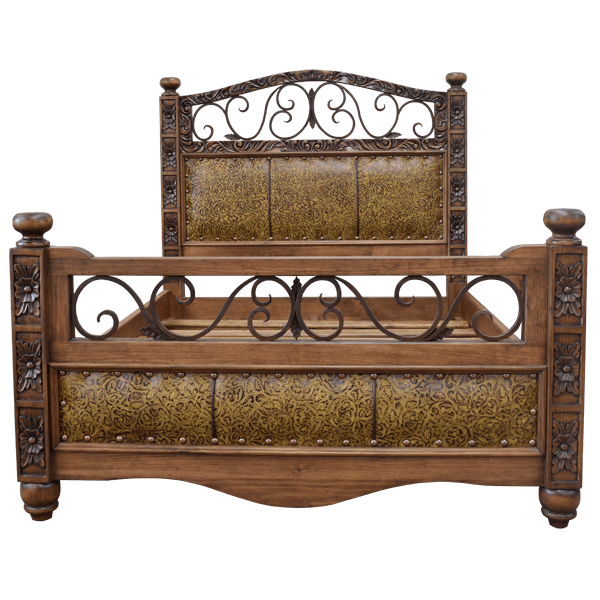 The top, curved frame is embellished with an elegant, hand carved, floral and scroll design, and the open area is accented with ornamental, hand forged ironwork. The lower front of the headboard is enhanced with four, padded panels, and the panels are upholstered in patterned, full grain leather. Each panel is divided by a leather braid, and the junctions of the leather are double stitched together for extra strength and durability. The leather is secured to the headboard with intermittently hand tacked, large, gilt nails. 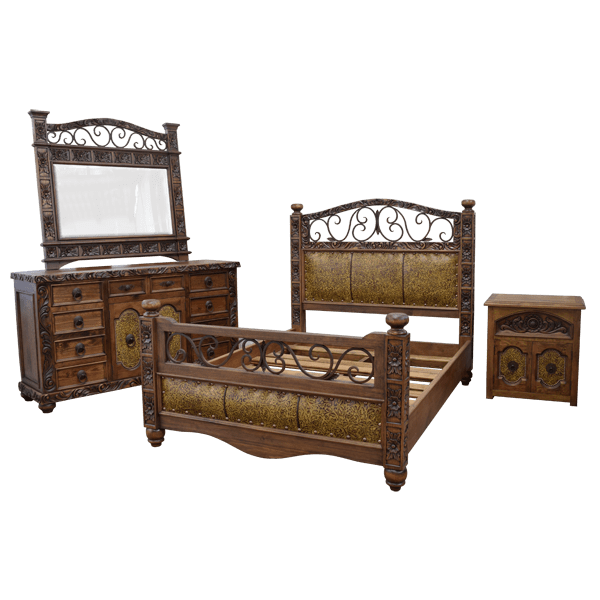 The headboard is framed with solid wood uprights, and the face of each upright is garnished with hand carved, floral designs, and topped with a hand turned sphere. The bed has a solid wood, rectangular, framed footboard, with a large, open area. The open area is highlighted with decorative, hand forged ironwork. The lower footboard has four, padded panels, and the panels are upholstered in matching, patterned, full grain leather. The leather is secured to the headboard with intermittently, hand tacked, large, gilt nails. Each panel is divided by a leather braid, and the junctions of the leather is double stitched together for extra strength and durability. The lower part of the footboard has a solid wood, colonial style, curved apron. 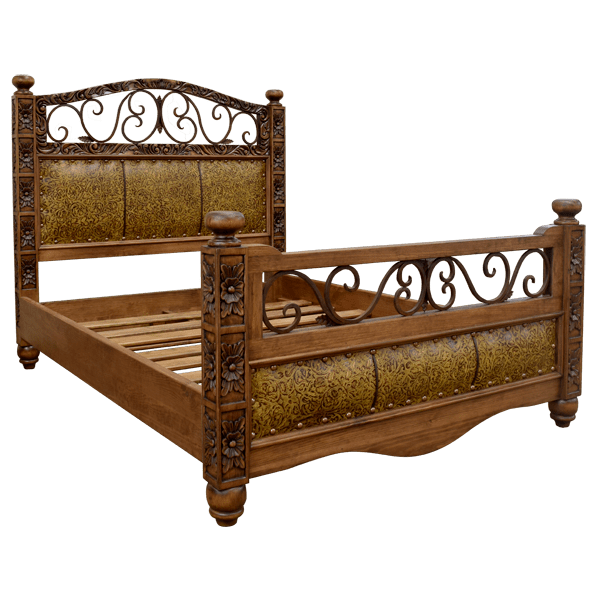 The footboard is framed with solid wood uprights, and the face of each upright has hand carved, floral designs, and topped with a hand turned sphere. The bed has a solid wood, structural frame, and it rest on hand turned feet. It has an antique finish, and it is made with the best, sustainable, solid wood available. The bed is 100% customizable.